I was quite pleased to see in a past issue of Honoho Geijutsu a feature on Rokuro Nakamura. Quite a bit of what I learned about guinomi and tokkuri came from picking up one of his sake utensils some thirteen years ago. It wasn't the words he spoke to me the first time I met him but the feel in his work that was the teacher. The first guinomi of his that I acquired was like getting a key into the fine art of drinking sake with style and grace. Thank you Rokuro for dedicating so much of your life to perfecting something so simple yet so satisfying- a cup and flask for sake. Unfortunately, the chance to thank someone sometimes never happens because of unforeseen circumstances. Life has its ups and downs (just like Rokuro's guinomi lip!) and what is here today may very well be gone tomorrow. The first time I met Kaneshige Michiaki (1934-1995) was in a Tokyo department store in 1988 when he was there for grand Bizen exhibition entitled 'Kaneshige Toyo no Geijutsu ten'- I believe Michiaki also had a simultaneous exhibition, but a floor below. I had no introduction and my Japanese wasn't so good back then, but I walked up to him and introduced myself. He was very kind and polite. I asked him if I could visit him in Imbe and he cordially invited me to do so. It was about a year later that I finally made it down there and I'll never forget the great honor of stepping into the Kaneshige home. It was my only time in that noble house and the last time I ever saw Michiaki again. I must have been just another face of another curious foreigner that had happened to fall under Bizen's spell like so many in the past. Yet Michaki spent some time with me and his wife served tea, both were very hospitable, At that fateful meeting I finally got my first Michiaki guinomi- the dark purple cup that is as splendid as the 350-year old Kaneshige house. 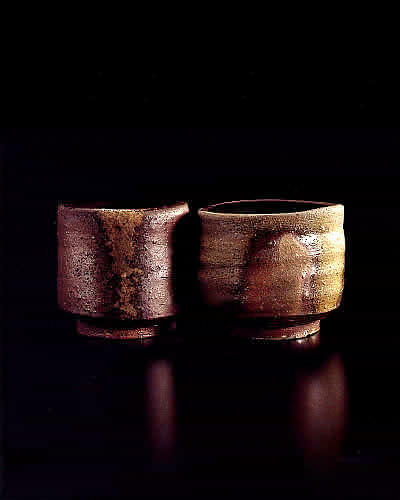 Inside on the bottom is the most fabulous dark green goma that only comes from the Kaneshige kiln. A thin river of goma has fused on the front of the cup looking like a distant constellation born in the kiln. 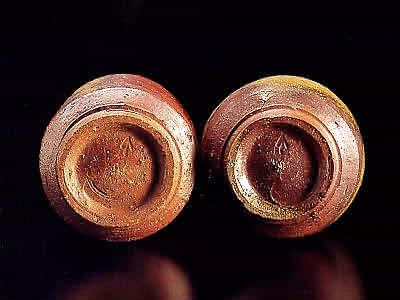 I know that the Kaneshiges process their clay in a unique way and the results sparkle on the surface of this cup- Kaneshige clay simply has no rivals. I mentioned to Michiaki that the cup was quite large and he replied that it need not be filled to the brim- a quarter full would be fine. Americans always think that full is better than three-quarters empty- I was quite moved by his answer and I'll always remember that lesson on ma (space). The second cup with its wonderful kase-goma also displays royal purple tones and the rich clay of the Kaneshige compound. Both cups have rounded lips, that unlike Rokuro's 'kiss,' roll off the lips. I often wondered why Michiaki used an arrow as the mark to sign his pieces. Was he pointing us in some direction or was he trying to say that wherever you are any direction you choose to go is alright. I'll never have the chance to ask Michiaki and I guess that it's better left a mystery. Michiaki is gone but his work is here-now, I raise my cup and point it in the direction of the arrow and in my mind and spirit I give silent thanks to family, water, health, love, and of course a silent toast and thanks to Michiaki Kaneshige.